Babies and child 5 or under £50 for accommodation, food and boat trips! Babysitter service available for £15 per day. Airport transfers from Marsa Alam, meet with guides. 7 nights accommodation and all Buffet meals, unlimited chilled mineral water, teas, coffee and soft drinks throughout the day and afternoon cake. Orientation at resort and snorkelling practice if required. If you are completely new to snorkelling we advise a short 2 hour training. 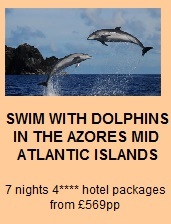 3 Dolphin Swim day trips including a freshly prepared lunch on board. Guests can book an additional day boat trip to the Marine Park Reserve. Excursion to Abudabab ( 15 mins transfer ) to see turtles and unlimited snorkelling on the house reef. Airport transfer from Hurghada (£45 supplement per person). Egyptian Marine Park environmental tax of 15 Euros per visit, per person (from 6 years old) to Dolphin House reef for divers and snorkellers. Extra activities and excursions, such as desert adventures on camels, souvenir shopping, diving and ancient Egypt tour. If you wish to extend your stay, extra nights at the resort can be booked. Babysitter service available for £15 per day. Child prices are based on child sharing a room with one or two adults. If children have their own room, please contact us as prices vary. Once you have decided which of our holidays is right for you, and have chosen your accommodation option, check to see whether there are flights available on the dates you wish to travel. Please note that we do not arrange flights and you will need to book this yourself. For our tips on booking your flight, see Getting There. If you find suitable flights, email us with your preferred holiday dates and choice of accommodation and we will confirm availability. You can reserve a place by paying the holiday deposit and then book your flights (£250 non-refundable deposit per person secures your booking. The full balance is due eight weeks before the start of your holiday). Please note: it is advisable to book early to benefit from the best flight prices and to be sure of avoiding disappointment, particularly during school and public holidays. We ask that all children (up to the age of 16) are accompanied by an adult. See below for our reduced child prices. Babies and toddlers (0-5 yrs) are welcome on our holidays for only £50 for accommodation, food and boat trips! Step 4: Pay the holiday deposit, book your flights and email us your completed booking form. You’re all done. It’s time to start getting excited about your holiday in the Red Sea with wild dolphins!